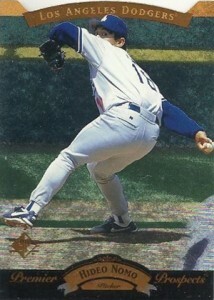 1995 SP Baseball doesn't have that one cornerstone rookie card like the two previous sets had. In 1993, there was Derek Jeter. And while he's not as popular as he once was, there's no denying that the 1994 SP Alex Rodriguez is still one of the key rookie cards of the 1990s (just a lot further down the list). Because of this, the third year of SP Baseball fails to garner the same attention and prices. However, it still has some nice designs that make it worth a look. The base set consists of 207 cards. That's an odd number but one that works out nicely for those who like to put them in pages. Photos are given a lot of space to shine save for the holographic foil triangle that runs along the side of the regular player cards. The foil for National League players is blue while AL players are red. The set kicks off with four SP Salute cards, 20 Premier Prospects and three checklists. All of these have a die-cut edge running along the top. Premier Prospects are also done with etched foil. 1995 SP Baseball has few rookie cards. The top one is Hideo Nomo, who doesn't have nearly the same clout in the hobby as he did in his early years with the Dodgers. The base set has a Silver parallel set. Inserted one per pack, these have a silver banner running along the side instead of the regular blue or red. The product has a pair of insert sets. Platinum Power is the easier of the two to pull, landing 1:5 packs. These have a rather plain design that has a die-cut edge along the top just like the base card subsets. Special F/X is a tough one to complete. The checklist has 48 cards with one landing every 75 packs. Not only do they come with a foil background but there's a small hologram of the featured player hovering at the card's mid-point. 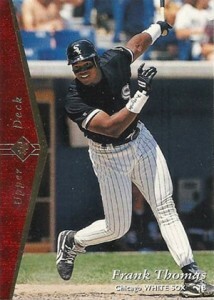 This isn't the only MLB set Upper Deck made using the SP brand in 1995. There is also 1995 SP Championship, a product targeting the retail market. The checklists and designs are different for both sets. Derek Jeter 1995 UD STAR ROOKIE ELECTRIC DIAMOND #255 N.Y Yankees Silver sp rc! 1990 Donruss Nolan Ryan 5000k + Diamond King + 1995 SP Die Cut - All Brand New!! 1995(2) Upper Deck SP Derek Jeter #181 Red & Silver Foil. Nice Rare Set of RC's! 207 cards. Shop for base sets on eBay. 48 cards. Inserted 1:75 packs. 1 card. Same as base card except with "For Promotional Use Only" written across the back. 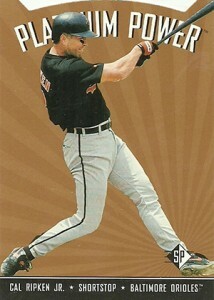 1995 UPPER DECK SP BASEBALL BOX 32 PACKS. 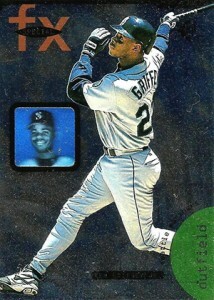 1995 Upper Deck Sp Baseball Box Nomo Rookie Griffey Jr. Auto? ?